Adrienne Rich has died. I am weeping. This is the poem that has been in my heart since I was a teenager, and led me to read so much more of her. I feel like I have lost a light. via Swimming In The Trees. Hi all! As the poetry editor for Ray’s Road Review, I’m always on the lookout for decent poetry submissions. Our next issue — Spring 2012 — is shaping up nicely, but I could still use some poems by one or two more poets. So, please go to the site. Read what’s there to get a feel for the publication, read the guidelines, and then please consider submitting some of your work. Thanks. As a poet and writer who is both a confessional writer and lover of confessional poetry and writing, I’m biased and I admit it. Still, I’m going to list MY top 20. I would love comments from anyone out there who encounters this post. Disagree, discuss, add to the list — whatever you want. Oh, and I think I’ll add my descriptive commentary on each of these books after the list, in order of the list (if that makes any sense). Cheers! The first Bukowski I ever read, decades ago, and I still remember to this day how it just blew my mind. I have all of his books, but this poetry book remains my favorite. Aside from my admittedly biased Buk fav — Play the Piano Drunk… — I’ve long felt this book was one of his strongest books of poems. One of the most important poetry books in American history. That’s not merely my opinion. Allen Ginsberg, Gary Snyder & many other big names heaped massive amounts of praise on this book, and with good reason. While Shields remains controversial re his bio/reputation, his books — particularly this one — just hit you in the gut, over and over, until you feel like you’ve gotten the hell beat out of you, yet strangely you want more. Massively intense! Locklin’s best, IMO. Great book! Geez, this is a serious classic. What can you say, really? This book, from early in the 1960s, went on to impact countless numbers of poets and aspiring poets ever since. She’s the superstar, and this book shows why. One of the very best contemporary anthologies I’ve EVER read, focusing, yes, on the L.A. coffeehouse confessional crowd, but packed with incredible stuff (including Bukowski, I believe — oh yeah, and me too — am I biased?). Get this! Similar to Scream When You Burn, but a bit more mainstream, IMO. My favorite Lifshin book, out of all of her millions of books. She IS the most heavily published author in the history of the world, right? Coleman presents a worldview that is slightly different than that of some of the other confessionals. Find her classic Black Sparrow books. Well worth the investment. My favorite posthumous Bukowski book. Good stuff. Another Shields poetic beating, brutal and rough, but you emerge (if you still have your sanity) simply amazed at this poet’s talent. Winans — major underground influence on the scene. I like Donna, always have. Good person, good writer. I don’t know if this book would make everyone else’s list for this topic, but I feel it’s worthy of inclusion. The under appreciated Voss is like the poor man’s Antler, yet I don’t mean that in a critical way. This book is good. Koertge. Shoot, any of his books will do! This is one of my two favorite books by Lummis. I’m not certain I would always categorize Clifton as a “confessional” poet, per se, but I do feel like this books lends itself toward that feel, and is worthy of making the list. Well, thank you for letting me “cheat” with some stuff I’d actually already done. I hope this list will find some new readers here and perhaps will encourage someone to read a poet previously unknown to them. Finally, off topic, I just found this out this afternoon while nosing around Amazon, and I did go ahead and add it to my post from yesterday, but I’m just so stunned at seeing this (for so many different reasons) that I want to mention it again. As of this afternoon, Amazon.com is showing that a new copy of my 2004 book, Cells, is available for purchase through a reseller for $164.13!!! Craziness! Who the heck would pay that for my book??? I remember thinking it was crazy when a used copy of another one of mine, Artifacts, was for sale at one of these online bookstores for $137 earlier this year. Seriously? I’m not Bukowski or Ginsberg people! Here’s a thing that honestly irritates me though. It’s not like I made a ton of cash off the royalties of these or any of my poetry books. Truly. 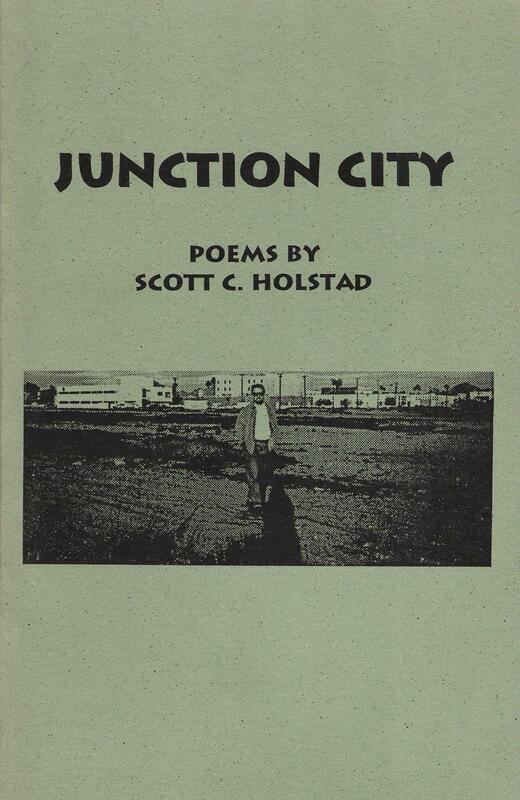 So, since I’ve seen a number of my old books for sale online over the past few years for over $100 at a time, there must be some demand somewhere for Holstad poetry collections, right? Yet, because these are sold used, or in this case of Cells today, new via a reseller, I’m not getting a penny from any of this! Yeah, that kind of irritates me. When my books were on sale new for $7 or $12 or $21.95 or whatever, I was damn lucky to get my standard 8% of the gross, which didn’t amount to much. Now that some of my old books are selling for hundreds of dollars, apparently, yeah, I wouldn’t mind getting a cut of that — they’re MY damn books and my words and my poems and my experiences and someone somewhere is making a sweet profit in selling these for those silly amounts. You know? Just my main thought on that topic….